From PhD student to post-doc, Phil Dee has been sharing his career experiences with fellow scientists in his regular and acclaimed Science Next Wave column since 2000. 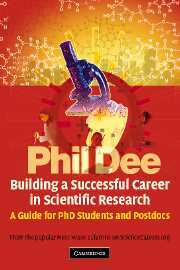 Now his invaluable and entertaining advice is available in this compact warts-and-all guide to getting your science PhD and subsequent post-doctoral employment as a researcher. Dee offers you the inside track on what life in the lab is really like with down-to-earth suggestions for handling personal relationships in science, maintaining your morale or designing a good poster. Foreword; Introduction; Part I. The First Couple of Years: 1. Choosing and handling your PhD adviser; 2. Motivation, time management and multitasking; 3. Handling the literature; 4. Report writing; 5. Powerful presentations; Part II. The End of the Beginning: 6. Writing papers and abstracts; 7. Conferences and poster presentations; 8. Writing and defending your thesis; 9. Coping with pressure and stress; Part III. The Transition to Postdoctoral Research: 10. The transition from graduate student to post-doc; 11. Collaboration and visiting other labs; 12. Supervising students; 13. Teaching; 14. Writing grant proposals and fellowship applications; Part IV. Making it in Science: 15. Culturing your image; 16. You and your big ideas; 17. Planning for a permanent job; 18. Do you have Principal Investigator (PI) potential? ; Epilogue; Web-links; Index.